Koninginnedag, also known as Queens Day, is an annual celebration in Holland that all Dutch citizens, as well as many foreigners, clubs, bars, and beer vendors, look forward to. Celebrated on the 30th of April (besides the one off 29th, which happens when the 30th is on a Sunday), everyone dresses in their bright orange attire and heads out onto the streets. The tradition first was first celebrated on the 31st of August 1885, as Princess’s Day. This was to celebrate the popular Princess Wilhelmina’s 5th birthday. When she inherited the throne in 1980 it was named Queen’s Day. When her daughter, Queen Juliana, took the throne, the day was moved to the 30th of April, her birthday. The next generation of the royal family, Queen Beatrix, kept the current Queens Day as a tribute to her mother. This year, 2013, will be the last Queens Day for a while, as Queen Beatrix will be abdicating from her throne and passing it on to her son, the first king of The Netherlands in over 100 years, King Willem-Alexander. Therefore, from now on Kings Day shall be celebrated on the 27th of April, his birthday. The celebrations start off with Koninginnenacht, or Queen’s Night. 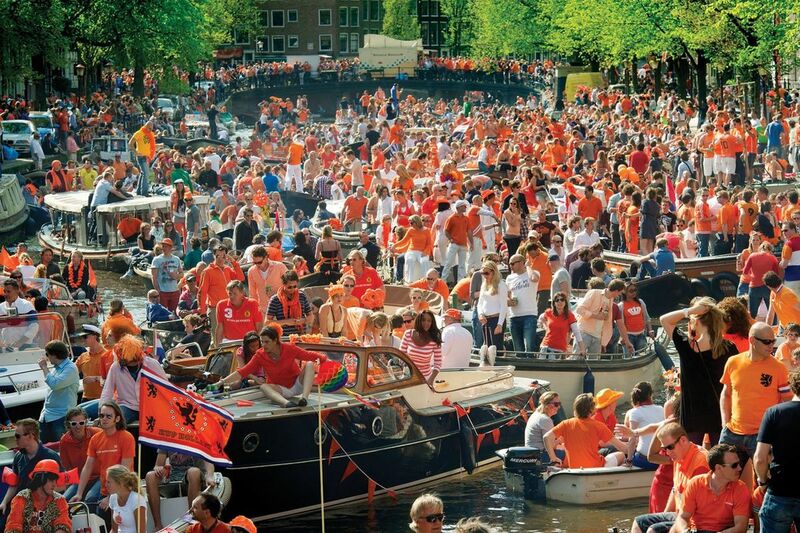 This is basically a pre-party to Queens Day where many nightclubs and bars have special events going on. After a long night of partying, many head out and try to sell, or buy, junk on the free market. This is the only day where people are allowed to sell on the street without a permit and having to pay the extremely high tax rates. Others go to one of the many concerts organised throughout the country. In the capital, it is also common to find the canals filled with long queues of boats trying to get into the city centre. Miraculously, despite all the terrible weather forecasts, Queens Day always seems to turn out like a sunny and warm summer’s day; but maybe it’s just because everyone is dressed in the bright national colour: orange. By many, Queen’s Day is no longer seen as a celebration of the Dutch monarchy, but more a day to unite, drink, have fun, be loud, and just have one massive national party. Two sweet things traditionally eaten around Christmas time in Holland are chocolate letters from Sinterklaas, and pepernoten (similar to kruidnoten). Rather than celebrate like many other countries, on December 24 or 25, the big day for the Dutch is December 5. Before Sinterklaas (their version of Santa/ Father Christmas) arrives, on the 5th, children leave their shoes next to the fire place – or nowadays, the radiator – in the hope that their shoes will be filled during the night. Normally, they leave a little treat for Sinterklaas’ horse, like a carrot or some hay. When they wake up, they find some sweets or a little present in their shoes. Pepernoten and kruidnoten are like little round biscuits, often mixed with sweets and given in sacks to little children at the time of Sinterklaas. They are spiced with ginger and cinnamon, and are often hidden in rooms along with chocolate coins for children to hunt for on Sinterklaas eve. At many Dutch Sinterklaas parties, people also receive chocolate initials, the first letter of each person’s name. These letters, which come in melk (milk), witte (white), or puur (dark) chocolate, are popular throughout the Sinterklaas season, early December, and are eaten by children and adults alike. The letters are only sold from the first day of October till December 5 . We can trace the custom of giving people edible letters back to Germanic times – when children were born, they were given a bread letter as a sign of good fortune for their lives. Interestingly, we can see evidence of pastry letters in some Dutch Masters‘ still-life paintings which date back to the 1500 and 1600’s. This week’s WOTW is maliënkolder – and means chain mail in Dutch. I realise this might not immediately strike you as the most useful word in the world, but if you ever find yourself in the middle of a battle-ground in medieval Holland, you’ll be glad you knew it.